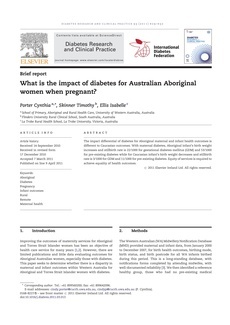 eCite - What is the impact of diabetes for Australian Aboriginal women when pregnant? What is the impact of diabetes for Australian Aboriginal women when pregnant? The impact differential of diabetes for Aboriginal maternal and infant health outcomes is different to Caucasian outcomes. With maternal diabetes, Aboriginal infant's birth weight increases and stillbirth rate is 22/1000 for gestational diabetes mellitus (GDM) and 53/1000 for pre-existing diabetes while for Caucasian infant's birth weight decreases and stillbirth rate is 3/1000 for GDM and 11/1000 for pre-existing diabetes. Equity of services is required to achieve equality of health outcomes. © 2011 Elsevier Ireland Ltd.